So, you’re in a foreign country, walking away from the crowded touristy streets in search of an authentic cultural experience. You feel the hot sun on your skin and a whiff of the tasty traditional cuisine. Not sure where it comes from? Just launch an AR app on your phone, point it at the street and you’ll see the names, ratings and specialties of every restaurant on the horizon. Sounds too good to be true, doesn’t it? But location-based augmented reality apps like this are already here, ready to make the lives of their users so much easier and more entertaining. True, the AR industry faces certain technical and social challenges. Creating markerless GPS-based augmented reality apps falls into the first category. Placing AR objects like signs or pictures over physical objects on the go without any markers is a job not every AR app development company can do. But let’s have a look at some markerless AR development concerns and ways to tackle them. Developers need to put a lot of effort into delivering a good location-based AR mobile app. The device and the app have to define the location of the physical object (e.g. building), calculate distance and attach a virtual object (sign, text, picture). Simply slapping on the digital element won’t do the trick. It has to be placed accurately, stick tightly, remain stable and not jiggle when the user is moving or changing angles. But high levels of accuracy are hardly achievable with a phone GPS alone. The issue requires a complex solution. Developing a high-quality GPS-based AR app requires using specialized augmented reality SDKs with the SLAM method and the markerless technology. Augmented reality mobile apps fall into two categories: marker-based or markerless (location-based). Marker-based apps are all about image recognition. Basically, these AR applications are programmed to identify specific preset markers (QR code, picture, symbol, pattern) through the smartphone camera. The moment this app recognizes the marker, an augmented reality object pops up to deliver the necessary information. Markerless or location-based apps, however, don’t need any patterns or markers to function. They deliver an engaging AR experience based on the camera, GPS, accelerometers and other sensors to define the location of the user on the go and all surrounding objects. These location-based apps are exactly what the AR industry needs to engage more people in augmented reality. Simultaneous localization and mapping (SLAM) made a breakthrough in 2017. This revolutionary technology allows apps to understand the environment and create maps for more accurate digital object placement. Thanks to SLAM’s algorithms and sensors, the virtual objects in AR apps that overlay the real-world stay still, don’t bounce or float when the user is moving. Perfect! Here are four of the most popular AR SDKs that support SLAM and the markerless technology. ARKit offers everything you need to build a great location-based AR app: Visual Inertial Odometry (VIO) for accurate environment tracking, 1080p HD imagery support, scene understanding and lighting estimation, powerful devices with advanced camera sensors and a big, supportive community. The updated ARKit version 1.5 supports vertical planes. And now that iPhone sensors can recognize the walls around, accurately placing AR objects like signs and linking them to vertical spaces like buildings on the street is not a problem. Please mention the drawback: ARKit works only on some latest iPhones with latest iOS (mention exact versions). Unlike Apple, Google has been fiddling with realities for a long time now. The effort they put into creating Google Glass and Tango transformed into the experience Google used to launch its own AR SDK – ARCore. Don’t be mistaken: Tango and ARCore are different projects. The main difference is that ARCore doesn’t require any additional or specific hardware to bring augmented reality to Android users – it’s all in their phones. One of ARCore’s strongest features is mapping. It’s great for collecting and storing real-world 3D localization data – a handy trick for markerless AR apps. The SDK also has some great positioning and environment features like anchoring objects (to place digital objects accurately), environmental understanding (detects horizontal surfaces) and motion tracking (determines the devices position and orientation in regard to its movement). Android device fragmentation has always been a double-edged sword for users. That’s why ARCore’s biggest inconvenience is the small number of devices that can actually use it. Google promises to increase this number to roughly 100 million devices, but for now, ARCore is only available on Google Pixels and Samsung S8 running on 7.0 Nougat. Wikitude has become a household name in AR application development. Having the world’s leading cross-platform AR SDK, Wikitude can boast over 20 000 developed applications and more than 100 000 registered AR developers. This all-in-one AR framework provides an SDK for Android, iOS and smartglasses to create both marker-based and markerless AR apps. It features image recognition and tracking, object recognition and tracking, 3D markerless tracking (SLAM) and geolocation. Thanks to extensions, Wikitude is also compatible with other platforms and frameworks. It offers plugins for Cordova and Unity, a Titanium module and a Xamarin component. But the best part about Wikitude is that it has recently settled the ARKit vs ARCore debate. And the winner is… Wikitude! In SDK 7.2, Wikitude premiered its “Seamless AR Tracking” feature – SMART. SMART blends ARCore, ARKit and Wikitude’s SLAM engine into a single AR SDK. This remarkable API makes augmented reality apps cross-platform and suitable for a much wider array of devices. According to Wikitude, SMART will allow covering 92,6% of iOS devices and about 35% of Android devices with high-quality markerless AR apps. And thanks to this new feature, Cordova, Titanium and Xamarin developers will finally be able to work with ARKit and ARCore. No more platform-specific code! The Wikitude SDK will analyze the user’s type of device and determine which one should be used in that particular case: ARKit, ARCore or Wikitude’s SLAM. The downside? Wikitude is pretty pricey. If you want to build a markerless GPS-based AR app, the commercial license will cost you around 2 500 EUR for one Android and one iOS app. On the other hand, if you use Wikitude to create a stellar AR product, you’ll return the investment in no time. As the name suggests, KudanSLAM knows a thing or two about simultaneous localization and mapping. It offers a unique approach to tracking and mapping and has modules designed to work with already generated SLAM maps. Object positioning in Kudan’s AR apps is highly precise and accurate, with no drifting or trembling – perfect for markerless GPS-based augmented reality apps. KudanSLAM is very flexible. It allows creating AR apps for different hardware and operating systems, targeted at a wide variety of purposes and audiences: mobile, IoT, AI, robotics – you name it! Kudan is also extremely configurable, easy-to-implement and shows impressive performance results. The trick about Kudan’s AR app speed is in low-latency tracking at high frame rates. This means that, unlike ARKit and ARCore, KudanSLAM apps can run on low performance processors. Kudan’s pricing varies but there is a free non-commercial license for indie developers, making it a good fit for budding startups. According to Tractica, by 2022 there will be nearly 1.9 billion unique monthly active users of mobile AR globally, bringing the revenue of $18.5 billion annually. Yes, that many. Just to imagine that a couple of years ago this potentially billion-dollar market was a geeky hype nobody took seriously. Now, industries like retail, education, manufacturing, construction, healthcare, tourism and marketing make use of augmented reality. All thanks to the advent of powerful devices and slick SDKs for smooth AR app development. 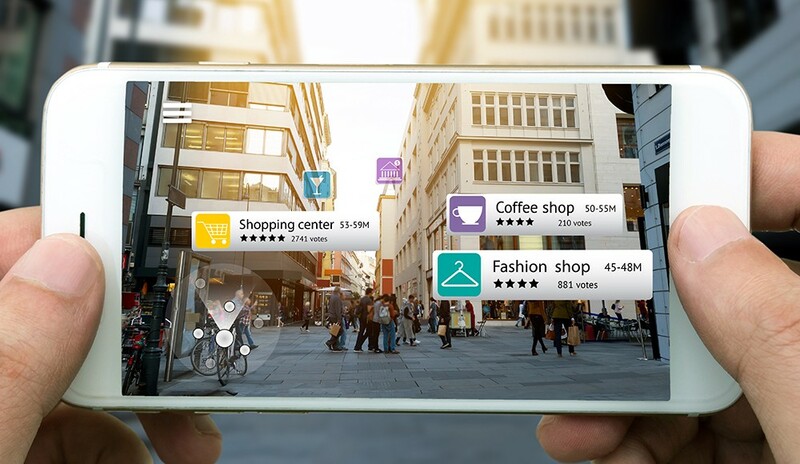 Location-based AR apps are a great way to shake up customers. The experience they offer is not only exciting; it’s also extremely relevant, allowing businesses to make precise offers to the right people at the right moment. But building high-quality markerless GPS-based AR apps is no piece of cake. For an application to be truly entertaining, it has to be accurate and natural. The combination of SLAM, markerless technology and a specialized AR development SDK can make the app perfectly precise. Sure, you can try to do it the hard way and develop a mobile AR application like this by yourself. Or you may find a professional AR app development company from Ukraine or one of the top AR app development companies in the UK and build an excellent application together. Augmented reality gains popularity worldwide, so don’t hesitate. The opportunity for your location-based AR app might be just around the corner. Which projects PHP is the best fit for?